The adorable kitten sleeping in your lap is a link to a bygone world, and it has the Near Eastern Wildcat to thank for that. This beautiful little wildcat is one of several small subspecies of wildcats that are found in Africa, the Mediterranean and parts of Asia. Genetic studies conducted by scientists have shown that the Near Eastern wildcat is in fact, the direct ancestor of that cute kitten currently snoozing in your lap. The domestic housecat was domesticated from the Near Eastern wildcat Felis sylvestris lybica between 9,000-10,000 years ago in an area known as the Fertile Crescent region. By comparing 977 genes from wild and domestic cats, especially the mitochondrial DNA, they discovered that domestic cats shared at least five matriarchal lineages. The emergence of the domestic cat coincides with the beginnings of agriculture. It’s entirely likely that both cats and humans realized they were getting a good deal. Stored grains attracted rodents, and that in turn attracted hungry cats and it most likely wasn’t long before the humans realized they now had free rodent control. The genes of these cats can still be found in the arm chair tigers and portable panthers who share our hearth and home today. Felis sylvestris cafra, the sub-Saharan wildcat. All of these cats are so closely related that they can still interbreed with domestic cats. The Near Eastern wildcat evolved from the European wildcat. In turn, the African and Asiatic species evolved from the Near Eastern form. Bearing both spots and stripes, this cat looks pretty much like the neighborhood tabby and if one were to show up on your doorstep tomorrow you’d probably assume someone had lost their cat. It’s likely you’d think this cat was adorable, too. In 2004, the discovery of an ancient site in Cyprus where a cat was buried some 9,500 years ago does indeed show that domestic cats and humans have shared a long history. Something marvelous to reflect on a rainy night while that cute kitten snoozes in your lap. 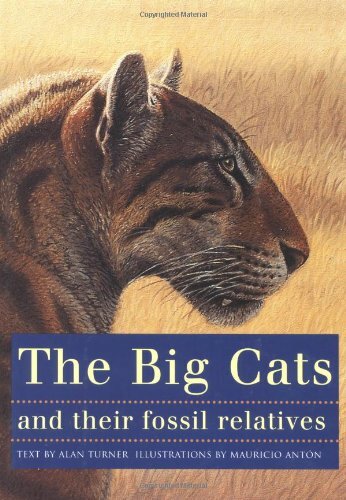 This book is an interesting read with wonderful artwork that gives the reader a real idea of what the world of these ancient cats was like.